Among city-dwellers, there are those that dream of a different life. This dream often brings them out of the city, back to the land, and, in some cases, leads them to a life of organic farming. When Todd and Julia McDonald met they shared such a dream. 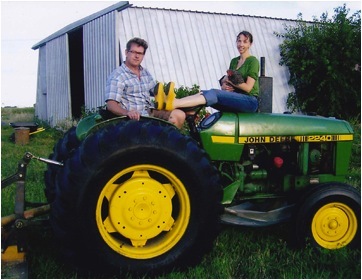 Living in Chicago, Todd and Julia often entertained the idea of becoming organic farmers. “I distinctly remember one of our first conversations in which we both disclosed our ideas for our futures, what we wanted to be ‘when we grew up.’ [Todd] said ‘I don’t have any great ambition. I just want to be an organic farmer,’” said Julia McDonald. The term peasant, as the McDonald’s explain on their website, has two definitions. The first refers to a class made up of small farmers, sharecroppers, and tenants. The second refers to a simple country person. Both definitions apply to the life the McDonald’s have created for themselves at Peasants’ Plot Farm. Todd is the “Head Peasant.” In this capacity, he acts as lead grower, is responsible for all the field management, and works with 5 to 6 part-time employees and about 10 worker shareholders. Julia’s role on the farm has gradually become more “behind-the-scenes.” She handles marketing, blogging, finding and placing farm labor, communication with CSA members, and goes to the city every Tuesday for deliveries and the farmer’s market. Through their desire, dedication, and collaboration the McDonald’s have managed to create a thriving CSA business. Their primary crops include salad mixes, lettuce, radishes, arugula, spinach, chard, kale, kohlrabi, beets, bunching onions, carrots, potatoes, tomatoes, zucchini, squash, cucumbers, peppers, garlic, dill, cilantro and basil, which they chose to fit their CSA business model. “We want to offer a very easy-to-use CSA share with mostly what we consider staple vegetables,” said Julia. Now, for the McDonalds, the key to their farming dream was contingent upon the word organic— and not necessarily in the “USDA certified” sense of the word. Like the word peasant, the word organic has multiple definitions (and even more connotations.) But to the McDonalds, the word organic refers to a broader mission of environmental and social responsibility. “Organic agriculture at its best implies ‘small farming’ and ‘local’ and ‘energy-efficient’ and ‘nutritious’ and ‘sustainable.’ In other words, quality over quantity,” Julia McDonald explains on their website. To live up to their own vision of organic farming, the McDonald’s employ various sustainable practices. For starters, they always use land that has been free of conventional farming for at least 3 years. Then, they plant green manure crops to restore soil structure and fertility. In order to avoid the use of synthetic fertilizer, they use fish fertilizer as foliar spray and compost from neighboring horses. And, in order to avoid the use of herbicide, they rely mostly on good old fashioned weed pulling. They also face the challenges that confront all farms, organic or not. Fluctuating weather and climate change are always looming issues because extreme weather often leads to unexpected expenses. Last year, for example, when the Midwest experienced a severe drought, the McDonald’s had to pump water to their crops almost constantly, the end result being a significantly higher electric bill. In the long run, though, the McDonalds have managed to overcome these challenges and still stay afloat. According to Julia McDonald, the farm is self-sustaining, although not yet profitable. And they are continually looking toward the future. “We want to continue to streamline and to keep adding systems so that, ultimately, we can pass the business on to the next generation,” said Julia McDonald. Reflecting back on their former life as city-dwellers with a simple dream of organic agriculture, Julia now realizes that their perspective at the time may have been somewhat unrealistic. But she also recognizes that some level of unfounded idealism is almost necessary to enter into this type of work, as well as to sustain oneself in it.